(Nanowerk News) Researchers at Hokkaido University have developed a new kind of hydrogel that bonds spontaneously and strongly to defected bones, suggesting potential use in the treatments of joint injuries. When soft supporting human tissues--including cartilage and ligaments, which are joined firmly to bones--are damaged, they cannot spontaneously repair inside the body. The use of artificial supporting tissues has the potential to significantly ameliorate damage to soft tissues. Progress has hitherto been hampered by the lack of materials that are strong, yet soft and pliant, for adhering to bone. 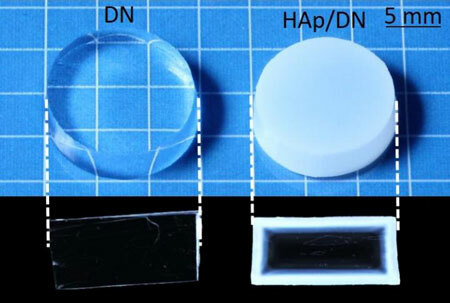 The DN gel (left) and the newly developed HAp/DN gel (right) are shown and their cross sectional views. The research group had previously developed a tough, high-strength network gel, called double-network gel (DN gel), that exhibited excellent performance such as low wear and inductive function for cartilage regeneration. However, as the gel's main component is water, it was difficult for it to bond with other surfaces--a major stumbling block in its practical application. The new gel, however, overcomes this problem. The team successfully added hydroxyapatite (HAp), the major inorganic component of bone, to the surface of DN gel by dipping it in calcium solution and phosphate solution. The HAp-coated DN gel (HAp/DN gel) was then transplanted into a defected bone in a rabbit. Four weeks later, the team observed that the gel had bonded to the bone very strongly, while the non-coated gel had not bonded at all. Electron-microscopic analysis revealed that the newly formed bone component in the defected area had penetrated into the gel surface, and fused to it seamlessly. Tough, nontoxic hydrogel that adheres strongly to bone is a major advance in the treatment of joint and soft tissue injuries. The research results are also promising for the potential application of tough hydrogel materials as cartilages. "The bonding between HAp/DN gel and bone mimics physiological bonding seen with cartilage, ligament and tendon, causing less stress to the body. We expect that the gel could be used to firmly attach artificial ligament or tendon to bone", said Jian Ping Gong, one of the lead authors of the paper published in Advanced Materials ("Double-Network Hydrogels Strongly Bondable to Bones by Spontaneous Osteogenesis Penetration").